One of my latest favorite organic baby clothing shops is Baby Keba! When you purchase Baby Keba clothing and accessories, you can be assured of the quality and value in their certified organic products. Baby Keba creator, Makeba Gies, draws from years of experience in the fashion industry and is pleased to offer their exclusive and unique, hand-crafted, 100% Peruvian organic Pima cotton baby wear collection. They offer 100% Organic Pima Cotton Ultra soft blankets, cozy rompers, sweet dresses, comfy booties, and more!! I received three great items from Baby Keba and I love them all!! The 100% ultra soft organic Pima cotton footed romper with embroidered butterfly logo in Antigua white is designed with babies comfort in mind and is perfect for playtime or cuddling. The material is SO SOFT and will be perfect for my daughter's early days - especially with how sensitive newborn baby's skin is! 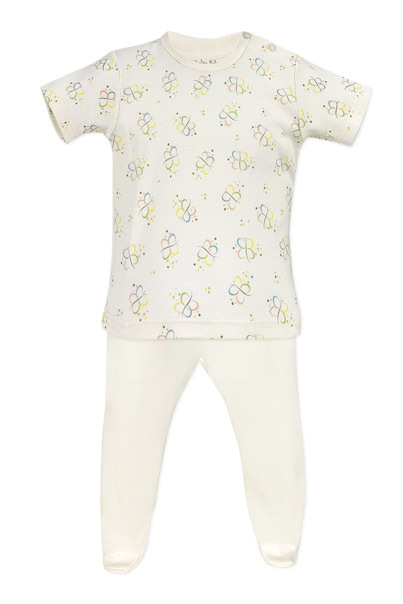 The Butterfly Footed Pant Set is a 100% organic ultra soft T-shirt with butterfly design and footed bottom and it is perfect for playtime and dressy enouch to wear out. It is sure to leave my daughter feeling happy and comfy at the same time and it will be perfect for this summer when my daughter gets to go outside! She will not only be super comfortable, but super cute with the cute butterflies all over! Best of all, all of these Baby Keba clothing are machine washable and dryer safe. Buy It: You can purchase all Baby Keba organic clothing on the Baby Keba website. Win It: Baby Keba is generously offering (1) super cute Baby Keba item to a lucky winner (the Butterfly Footed Pant set for girl OR Long Sleeve Kimono body suit for boy. These are only available in sizes 0-3, 3-6, or 6-9). The choices are pictured below.